Born in Cappadocia in the late third century, St. Nina (or Nino, the Georgian form) was the only daughter of a Roman general, Zabulon, and his wife, Susanna. On her father's side, she was related to St. George, and on her mother's, to the Patriarch of Jerusalem. When Nina was twelve, her family traveled to Jerusalem, where with the Patriarch's blessing, her father became a monk; her mother became a church worker; and Nina became the foster child of Nianfora, a pious elderly woman. Under the tutelage of her foster mother, Nina quickly learned the rules of faith and piety. At fourteen, Nina questioned her mentor about the location of Christ's robe; Nina felt that such an important relic could not have been lost. Nianfora told her that it was in Iberia (now Georgia), a land not yet completely illumined. When the apostles had drawn lots to determine who was to preach where, the Theotokos had received the lot for Iberia, but she had been held back from going and was assured that someone would later enlighten it. In a dream, the Theotokos came to Nina and urged her to preach the gospel in Georgia. The Mother of God assured Nina that she would protect her and as a pledge, left a cross of grape vines. Lord God, Our Saviour! As I let this young girl depart to preach Thy Divinity, I commit her into Thy hands. Condescend, O Christ God, to be her Companion and Teacher everywhere that she proclaims Thy Good Tidings, and give her words with such force and wisdom that no one will be able to oppose or refute them. And Thou, most Holy Virgin Mother of God, Helper and Intercessor for all Christians, clothe with Thy strength against all enemies, visible and invisible, this girl whom Thou Thyself hast chosen to preach the Gospel of Thy Son and our God among the pagan nations. Be always for her a shield and an invincible protection, and do not deprive her of Thy favour until she has fulfilled Thy holy will.1Nina joined the party of Princess Ripsimia, which was traveling to Georgia to escape the persecution of Diocletian. All but Nina, who was sheltered in a crevice, were martyred in Armenia after Ripsimia declined to marry the king, Tiridat. Strengthened and reassured, Nina continued until she arrived in Georgia, where she witnessed the worship of the local gods. Praying that the idols might be destroyed, she also witnessed a downpour that washed the idols into the river and out of sight. Nina settled in Mtskheta, the capital, where she lived in a hut near the royal gardener and his wife, Anastasia. There Nina gained a reputation for holiness both because of her daily piety and her miraculous healings. She cured Queen Nana of a disease no doctor had been able to relieve. King Mirian was converted when he was saved from a rain storm similar to the one that had destroyed his idols. After preaching to and converting many Jews and pagans, Nina learned the story of Christ's robe: a local Jew, Elioz, had obtained the robe from the soldier to whose lot it had fallen and had carried it home to Georgia. His sister, Sidonia, had clasped the robe to her breast and had died. No one could take the robe from her, and it had been buried with her. A cedar, now part of the royal garden, was said to have grown from her grave. Nina had doubts about the identification of the particular tree, but she knew from her visions that the ground was holy. Icons of St. Nina are written with her holding her grapevine cross, the pledge of her relationship with the Theotokos. 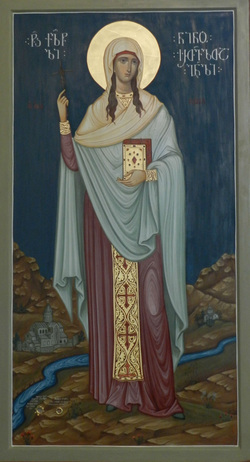 St. Nina is called Equal-to-the-Apostles because she preached the gospel in Georgia. Since the 17th century, iconographic tradition has revealed the scroll which she received in her second vision. Her title, her cross, and her scroll are the manifestations of her working with God to spread His word and to bring into His fold a new land.